Biodegradable Christmas wrapping paper can help you have an eco-friendly Christmas this holiday season. According to the Environmental Protection Agency (EPA), the United States generates one million tons of extra trash throughout the holiday season. A large percentage of this waste comes from tossed wrapping paper. You can do your part to cut down on the trash this season by purchasing eco-friendly paper. Biodegradable Christmas wrapping paper comes from a variety of eco-friendly sources such as recycled paper products and sustainable materials. The products are designed to break down easily in the environment, which reduces the amount of landfill waste created throughout the holiday season. They also come from sustainable or recycled materials, which are better for the planet. You have a few options when choosing an eco-friendly wrapping paper for your Christmas presents. Recycled wrapping paper uses recycled paper materials. The source of this paper comes from old Christmas paper, magazines, newspapers, paper bags, and just about any kind of paper you can imagine. 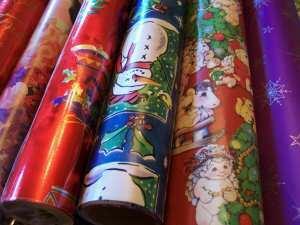 Using recycled materials to create wrapping paper causes less pollution and creates less waste. Recycled wrapping paper comes in a variety of holiday colors, patterns and designs. Sustainable wrapping paper uses non-tree materials such as bamboo, the Himalayan lokta bush, abaca, and hemp. Sustainable materials are beneficial to the environment because they can be grown again and again fairly easily and quickly, unlike trees, which can take decades or longer to reach maturity. You can also purchase a host of ribbons, bows and gift tags made from recycled and sustainable materials. Many of the companies making sustainable and biodegradable wrapping paper also make a full line of extras so you can jazz up your gifts but remain eco-friendly. The ink used on eco-friendly wrapping paper, ribbons and bows often comes from sustainable soy-based products. Soy ink has several benefits to the environment. For one, it is easy to grow and maintain, requiring very little water. Soy also leaves less agricultural residue than many other crop varieties. Once created, soy ink has low volatile organic compounds (VOC), so it produces less air pollution than standard petroleum-based inks. Paper collected in recycling bins is sent to a paper mill. From there the paper goes through a large pulper device containing a blend of chemicals and water that breaks down the paper into fibers. The fibers are then pushed through a screen to filter out glue, dirt and other residue to form a clean patch of paper pulp. The paper mill then blends the pulp into new paper products, such as wrapping paper. Wrapping paper can come from a mixture of tough paper products such as magazines, newspapers and printer paper. Several online designers make biodegradable Christmas wrapping paper. Of the Earth makes a line of wrapping paper made from sustainable materials. The company uses the lokta bush, which is a strong fiber you can save and reuse on next year's Christmas presents, or you can plant your wrapping paper after the presents are opened. The Of the Earth wrapping paper has embedded in wildflower seeds that will sprout as the paper starts to biodegrade. Fish Lips Paper Design makes a line of wrapping paper in both prints and solids. The gift wrap comes from 100 percent recycled paper and the prints use a soy based ink. The designs feature popular Christmas patterns like deer, Christmas trees and ornaments, and the paper starts at only four dollars a roll. Botanical PaperWorks sells a line of biodegradable Christmas cards and gift tags made from sustainable plant sources. Each card and gift tag has seeds embedded so the recipient can plant the paper after they have finished using it for a beautiful gift all year long. After the holiday season you can save your used wrapping paper to use on next year's gifts. If the paper is too damage to reuse, you can recycle what is left or add it to a compost pile. Paper made from sustainable, plant-based products will break down quickly in a compost bin, saving it from the landfill.